Sorghum just may be my favorite new grain (though technically a grass), and I'm hoping you'll fall in love with this delicious and healthy grain too. Since my Celiac diagnosis six months ago, I've been in search of an ancient grain to replace my beloved farro, a type of hulled wheat and therefore verboten on a gluten-free diet. Sorghum, like farro, has a wonderfully chewy texture, nutty flavor, numerous health benefits, and it's gluten-free. It's a powerhouse of vitamins and minerals, is high in protein, and a serving can offer up to nearly 50% of our daily requirement of fiber, something in which most Americans are significantly deficient. Women should get 25 grams a day, men 38 grams, but most of us get far less than that. So, sorghum gets us halfway there! Sorghum can also help improve digestion, circulation and heart health, manage diabetes, protect and maintain bone health, among other health benefits. I don't know why it's taken me so long to give sorghum a try! Unfortunately, whole-grain sorghum can be challenging to find, but you can order Bob's Red Mill Sorghum on Amazon here. Note: sorghum flour is easily found in well-stocked markets and is often used in gluten-free baking. 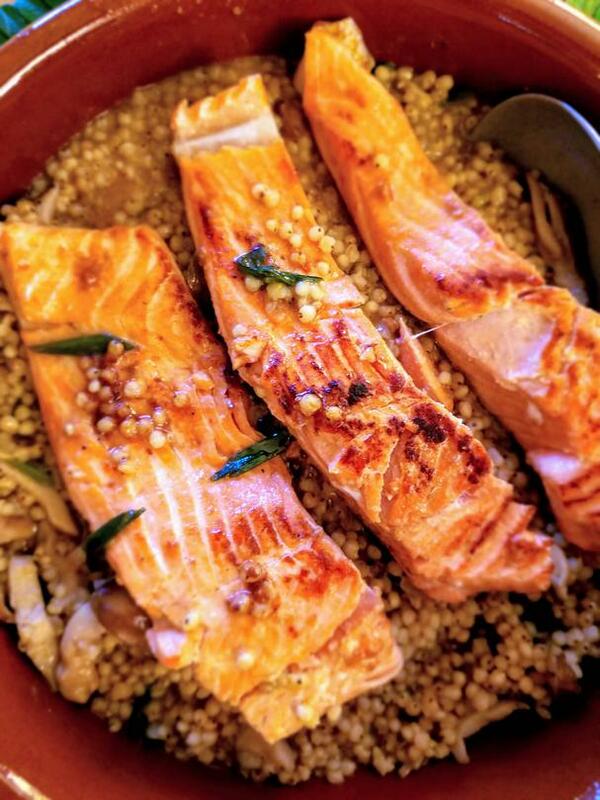 I found a delicious sorghum recipe in a recent CookingLight issue, and it inspired me to cook up this ancient grain. Sorghum, especially whole-grain, takes at least an hour to cook, but just pour yourself a glass of heart-healthy red wine and relax while it simmers. The rest of the meal is easy to make. 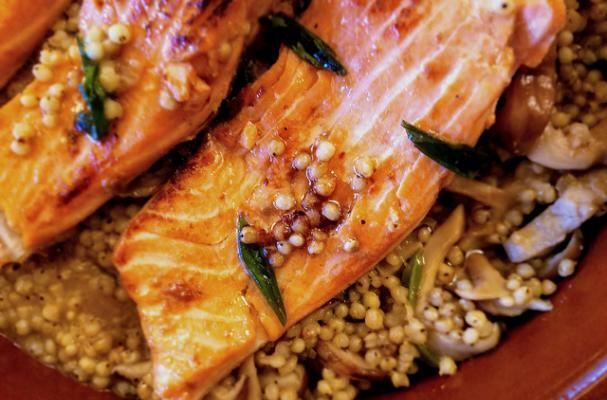 Once cooked, the grain is combined with sauteed shiitake mushrooms (another superfood! ), shallots, green onions, and miso in an almost risotto-like dish. I decided to top it with some wild salmon fillets that I pan-seared in a bit of olive oil and butter. This dish is so comforting in a beautiful umami way and it's full of nutritious and delicious ingredients! Combine chicken broth and sorghum in a medium saucepan. Bring to a boil over high heat and cook for 5 minutes. Reduce heat to low; cover and cook for 1 to 1 1/2 hours; stirring after 30 minutes. Remove from heat, stir, and let stand covered 15-20 minutes. (Note: the grains will be chewy and slightly firm). Meanwhile, heat 1 teaspoon of olive oil in a large non-stick pan over medium-high heat. Add the mushrooms and season with salt and pepper. Saute until tender. Transfer to a bowl. Reduce heat to medium and add shallots, green onions, and 1 tablespoon butter. Saute until tender and fragrant, then add to mushrooms. Drain sorghum, reserving about 3-4 tablespoons of the liquid (add more if you'd like it more risotto-like). Melt remaining butter in the skillet over medium heat. Whisk in the miso and the reserved liquid from the sorghum. Add the sorghum and mushroom mixture and stir to incorporate. Taste then season accordingly with salt and pepper. Transfer to a serving dish and cover to keep warm. In the same pan, heat 1/2 tablespoon each of butter and olive oil. Whisk together over medium-high heat until combined. Add salmon fillets skin-side down (if there's skin on) and sear until golden, about 5-7 minutes depending on thickness. Carefully turn and sear the flesh side for another 3 minutes. Remove from pan and place on top of mushroom miso sorghum. Garnish with lemon wedges and serve.